KEF KHT3005SE-K2 review | What Hi-Fi? In these difficult financial times, KEF is re-positioning its style speaker systems. You can read the full details in our news story, but basically the firm is introducing more affordable versions of same of its best-selling speaker packages such as the Award-winning KHT3005SE. What we have here is the excellent 3005 satellites partnered with the more affordable KUBE-2 subwoofer – hence this new package, the KHT3005SE-K2 at £1000. We've been keen on these satellites for some time. They create a superbly seamless surround field while also producing terrific clarity and focus from voices and effects in the centre channel. In fact, for the balance between soundfield dispersion and centre-channel focus, the KEF package is one of the best around. The satellites spread the sound superbly, integrating and cohering throughout the room regardless of its size – or how close to them you sit (within reason). The extra drivers on the larger, centre speaker help produce sublime midrange clarity and directness. What this adds up to is action scenes with wonderfully accurate surround effects and seamless ambient noise, alongside crystal-clear dialogue. The KEF makes sense of even the frantic battles on the Band of Brothers Blu-rays. The KUBE-2 sub backs up this performance with plenty of deep, powerful bass, making exploding grenades sound all the more deadly. It's not a perfect bass box, however, and slightly lacks the agility and bite to follow and integrate basslines. The bass has a slightly cavernous quality, and bass notes don't decay with the precision and tunefulness of close rivals. That said, it's not a problem if all you want your sub to do is boost big bangs, but if you're looking for more musical ability, there are others that trump the KEF for integration and outright punch and precision. There is an awful lot to love about the '3005SE-K2: the three-dimensional soundfield it produces is class-leadingly solid, smooth and cohesive. 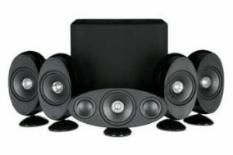 If you want your style speaker package mainly for movies, this should be on your must-hear audition list.